Togo’s 3.5 million voters went to the polls on April 25 to elect their president for the third time since the death of long-term autocrat Gnassingbé Eyadéma in 2005. The principal opponents were incumbent Faure Gnassingbé, Eyadéma’s son, and Jean-Pierre Fabre of the National Alliance for Change (ANC). Voting proceeded peacefully on election day after months of political tensions running high. The National Independent Electoral Commission (CENI) published provisional results on Tuesday evening showing a strong lead for the incumbent. Jean-Pierre Fabre filed an official complaint on Monday, citing irregularities, and has denounced the preliminary election results as a “crime against national sovereignty”. Faure Gnassingbé’s father, Eyadéma, had governed the country with an iron fist for 38 years from 1967 to 2005. In 2002, he changed Togo’s constitution to eliminate presidential term limits and reduce the minimum age from 45 to 35 years. Faure Gnassingbé was 35 at the time. He was appointed president by the Togolese military after his father’s death in 2005. The younger Gnassingbé’s accession to power was confirmed by the presidential election organized in April of the same year under heavy pressure from the Economic Community of West African States (ECOWAS). The election, heavily criticized by the international community and Togolese democracy activists, ignited post-electoral violence that cost the lives of hundreds of protesters. In 2010, Faure Gnassignbé won a second term under Togo’s one-round electoral system with just over 60 percent of the votes against his principal opponent, Jean-Pierre Fabre who gathered about one third of the votes. The other five contesters reached only single digits. Although domestic and international observers noted irregularities in the organization of the polls, they were deemed overall credible and did not result in violence as in 2005. Nearly 3,278,000 voters had registered for that election; turnout was 64.7 percent. For the first time since Togo’s independence in 1960, non-partisan domestic election observers followed the proceedings. The legislative elections of July 2013 further consolidated Gnassingbé’s power. His party, the Union for the Republic (UNIR), won a majority of 62 seats in the 91-seat National Assembly, up from 50 in 2007. Togo’s voter registry had dipped to 3,044,332 voters for these elections; 66.06 percent participated. This month, Togo organized its third presidential election since 2005. The race was originally scheduled to take place on April 15. Tensions between supporters of governing and opposition parties had again been mounting for months. The opposition accused the government of manipulating Togo’s voter roll and alleged that one third of the 3.5 million registered voters in 2015 were fictitious. Faced with domestic and international pressure, Togo’s CENI heeded the recommendation of ECOWAS chairman, Ghanaian President John Dramani Mahama, in early March, to postpone the elections by 10 days to allow for an independent audit of the voter roll by the International Organization of la Francophonie (OIF). After three weeks of combing through Togo’s voter lists, the OIF published its report on April 8. It deemed the state of Togo’s voter registry “satisfactory” and gave its go-ahead for the elections to take place once some 300,000 entries were corrected. The OIF’s decision, publicly accepted by all parties, cleared the last obstacle for the contest to move forward. Five candidates competed for the president’s chair on April 25, including the incumbent for a third term and his long-term rival Jean-Pierre Fabre. Although tensions had been running high in the pre-electoral period, voting proceeded peacefully on election day. ECOWAS and the African Union (AU) deployed international election observers. The domestic 35-member civil society consortium Citizen Synergy for Democratic Elections in Togo (SYCED-Togo) deployed a total of 1200 domestic election observers across the country. After the polls closed, the consortium commended voters and the Togolese authorities for organizing peaceful elections, and highlighted the contributions made by the CENI and Togo’s security forces for the presidential elections (FOSEP2015). United Nations Secretary-General Ban Ki-moon also welcomed the peaceful conduct of the election and urged all candidates and their supporters to resolve any disputes that might arise in the election’s aftermath through legal procedures. The CENI released provisional election results in the evening of April 28. They are subject to validation by Togo’s constitutional court. According to these results, the incumbent took nearly 59 percent of the votes while Jean-Pierre Fabre scored just under 35 per cent. Turnout appears to be significantly lower than in previous elections since 2005. If the court confirms the results, Gnassingbé will lead his family into its fifth decade in power. On Tuesday, following complaints by Jean-Pierre Fabre’s electoral coalition about widespread irregularities, ECOWAS chairman Mahamane traveled to Lomé, accompanied by Côte d’Ivoire’s President Ouattara, to mediate among the political parties while the country awaits the constitutional court’s decision. Thus far, the situation has remained calm, though Jean-Pierre Fabre has released an appeal to the public to mobilize against the election results. The coming days will show whether the peace that characterized election day will continue after the constitutional court publishes its decision. For the first time in Togo’s history, a consortium of non-partisan domestic election observers undertook a statistically driven monitoring exercise, collecting results from a representative sample of polling stations on election day. The publication of the results collected by SYCED could provide an independent check on the official CENI results. If SYCED’s results confirm the outcome announced by the CENI, it could reinforce citizen confidence in the validity of the official results and contribute to a more peaceful post-electoral environment. This entry was posted in Africa, Togo and tagged Africa, election observation, presidential elections, Togo on April 30, 2015 by Sophia Moestrup. It is based on the following article recently published by the authors: INACIO, Magna and LLANOS, Mariana. The Institutional Presidency from a Comparative Perspective: Argentina and Brazil since the 1980s. Bras. Political Sci. Rev. [online]. 2015, vol.9, n.1, pp. 39-64. Available here. Even the most influential chief executives need the political support and technical assistance of trusted advisors, technical staff, and government agencies. The scholarly literature has documented the increasing centralization of authority around the person of the chief executive and the steady movement toward the institutional reinforcement of the political core executive as developments that have taken place in most advanced industrial countries in the last forty to fifty years. Students of the United States’ presidency, on their part, have shown that presidents have had incentives for creating and strengthening technical, administrative, and advisory presidential support bodies both to confront critical junctures and to help face the challenges that are posed in a system characterized by separate institutions sharing powers. In Latin America, presidents enjoy significant policy-making powers in multiple policy realms as a means to influence the legislative agenda, control the allocation of resources, appoint and dismiss thousands of different government officials, and respond directly to the demands of their electorate. However, the distinction between executive leadership and the institutional nature of the modern presidency has not been really addressed yet, despite there having been a significant expansion of studies on presidentialism. Our work sheds light on this under researched topic by focusing on the presidencies of Argentina and Brazil since redemocratization in the 1980s. In particular, our study concentrates on the “institutional presidency”, that is, the cluster of agencies that directly support the chief executive. These agencies are part of the bureaucracy of the executive branch, but they are not located within the executive cabinet; their defining characteristic is that they operate under the direct authority of the president and are responsible for supporting the presidential leadership. Following the specialized literature, we argue that the growth of the institutional presidency is connected to developments occurring in the larger political system – that is, to the governmental and political challenges that presidents face. Likewise, we argue that the type of executive cabinet – a factor that until now has not played a significant role in presidential studies, which are mostly based on the US case – poses various challenges to presidents and, thus, impacts differently on the structure of the presidency. Our empirical references, the presidencies of Argentina and Brazil and typical cases of single-party and coalitional presidentialism, respectively, allow us to test the impact of the aforementioned factor. In effect, we expect to find greater centralization –a shifting of the functions of the wider executive branch to the core executive – under coalition presidentialism because presidents must share cabinet positions, negotiate, and manage relations with coalition partners. In single-party governments, meanwhile, presidents can more freely assert themselves over the whole executive structure; in other words, centralization should be less necessary. Similarly, we expect the type of government to affect the types of agencies that form the institutional presidency, with coalition presidents building a more complex and varied presidential organization. To test our hypotheses we first collected information on the number of agencies under presidential authority in Argentina and Brazil per year from 1984 until 2010. Our data show reverse developments having taken place over these years, where the institutional presidency has at times been expanded and at other times reduced – and we thus inquire into the causes of such evolutions. We then estimated the effects of a set of political variables on those agency developments: we included the type of executive cabinet, and the extent of political support for the president, among other political and economic control variables. Our assumption was that the institutional presidency grows in response to the constraints of a political environment that can be a potential challenge to the presidential leadership. Our findings confirm our expectations. The regression analysis shows that as the number of parties in the cabinet increases, so does the size of the institutional presidency. It is also confirmed that when governing parties hold a legislative majority the number of presidential units decreases. Among the contextual variables, the model shows that economic reforms pose risks to presidents that translate into incentives to enlarge the institutional presidency. Agency movements have not only affected the size of the institutional presidency but also the types of agencies that form it. Our analysis shows that the monolithic Brazilian presidency of the 1980s has since been substituted by an internally differentiated and specialized institution, including a diversity of policy units, advisory bodies, and the strengthening of core units –those supporting administrative, legal, and institutional tasks. Instead, in Argentina, the internal makeup of the presidency is today less differentiated, as important functions such as coordination haven been decentralized in the wider executive. In short, our analysis provides evidence indicating that the type of government – coalitional or single-party – matters, for the variations in the architecture of the presidency. This is both a hitherto unexplored area of research vis-à-vis Latin America and an interesting agenda for the presidential literature in the future. Mariana Llanos is a Senior Research Fellow at the GIGA German Institute of Global and Area Studies. Her main research field is comparative political institutions, especially in Latin America. She has worked on presidentialism, presidential breakdowns, president-congress relations, president-judiciary relations, judicial appointments. She is also currently working on the institutional presidency in comparative perspective. Full details of all her publications and current porject can be found here. This entry was posted in Argentina, Brazil, Latin America and tagged Argentina, Brazil, Core executive, Institutional presidency, policy-making on April 29, 2015 by David Doyle. Kazakhstan – Nazarbayev re-elected as president. What’s ahead. 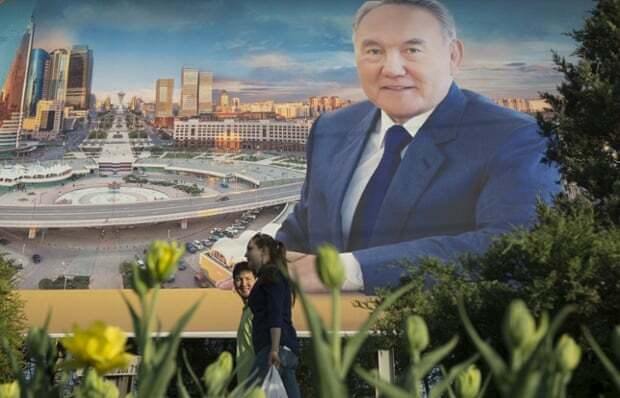 Hardly surprisingly, Nursultan Nazarbayev has been re-elected as Kazakhstan’s president on Sunday April 26. According to the Central Election Commission of Kazakhstan, there had been a record turnout of 95.11% for the poll and the votes in favour of Nazarbayev have been almost 98%. His two token-opponents gathered 2.3% the vote. The president, who is 74 years old and has ruled the country since independence in 1991, is now starting a new term, his fifth, in office. The Central Asian country has a semi-presidential system, and several constitutional reforms have been passed in order to ad hoc extend presidential terms or allow Nazarbayev to run for consecutive terms. Despite not being surprising, this election features some elements of interest to the observers. Kazakhstan has indeed gone through tough times recently, with both the economic situation being worsening as an effect of the Russian economic crisis; and an unclear future plan in terms of the post-Nazarbayev succession being increasingly a concern for the national elite and foreign investors. A sign of the impact of such growing concern and uncertainty was given by the government itself in first instance, when in March it called for early presidential election. During a TV appearance, Nazarbayev explained that ‘In the interests of the people… and for the sake of the general and strict implementation of the law, I have taken a decision and signed a decree calling an early presidential election for April 26.’ A more attentive analysis reveals how the Ukrainian crisis, the falling of the oil prices internationally, the constant devaluation of the national currency and the calls for the implementation of economic reforms can better explain the rush to re-confirm Nazarbayev as the leader of the executive in the country. Nazarbayev’s re-election has the benefit of solving all issues in one time, delaying the question of succession and reassuring the international finance community that the leader is firm in power and will keep the situation, politically and financially, stable. The economic crisis in Kazakhstan has hit badly and the future is rather unclear considering the enduring difficulties that Russia, to whom Astana is diplomatically and economically very close, is currently going through. In January, the European Bank for Reconstruction and Development cut the country’s growth projection for 2015 to 1.5% from 5.1%. In the meanwhile, prices of goods are rising, producers are having hard time in competing with foreign products from Russia and China and the national central bank is rumoured to be likely to devaluate the national currency, the tenge, again. It is worth mentioning that the tenge has lost almost 20% of its value in one day last year, triggering popular protests in a country known world-wide to be protests-free. Considering this situation, the decision of calling for early election has the goal of avoiding preparing for election in 2016 in order, on the contrary, to focus on strengthening the economy and prevent the crisis to further hit the country. Nazarbayev has acknowledged this difficult situation, and declared in November 2014 that “Kazakhstan, as a part of the global economy and a country close to the epicentre of geopolitical tension, is feeling the negative effects” adding that “the next years will be a time of global tests for the world, and for us too,” concluding that “not all the states will be able to adequately go through this stage. This frontier will be crossed only by the strong, united nations and countries.” The strategic plan that will constitute the backbone of the Kazakh exist strategy from the crisis is advanced in a document titled “The Path into the Future” which was presented by Nazarbayev in November and that involves the diversification of the economy and the active development of the non-oil sector as the main goals to be attained. Nazarbayev also intend to reform the political system by the means of pro-democracy and meritocratic reforms after the economic situation will be stabilised. He is proposing a well-known rhetorical pattern sweeping through Central Asian authoritarian systems, whereby political pro-democracy reforms are to be carried out once the economy is strong enough. For instance, Karimov in Uzbekistan has adopted a number of liberal and democratic-minded documents, which set out the need of strengthening democratic and accountable good governance, civil society and the rule of law – liberal buzzwords that usually constitute authoritarians’ international discourse. Karimov, who ironically was re-elected last month and who is as old as Nazarbayev and faces similar succession challenges, has been an inspiration to Nazarbayev who declared that “first – a strong state and economy, and then – politics”. At the right time, then, Nazarbayev intends to tighten requirements for judges and law-enforcement bodies, and secure the rule of law. Also, he plans to create a modern, professional and autonomous state apparatus, with no room for nepotism, protectionism and corruption. Along with such changes, a new system will be introduced for paying the wages of officials in line with the efficiency of their contribution to the administrative process; and talented expatriates will be called back in Kazakhstan and offered a position in civil service. In order to start implementing these reforms, Nazarbayev intends appoint a special commission. Along with such themes, Nazarbayev’s electoral campaign has been much characterised by usual refrains of national harmony, celebration of national identity and condemnation of ethnic sectarianism. Nazarbayev’s re-election also helped to easy the concerns for another issue, namely succession. The question of “who will come next” is particularly pressing now since no clear leadership is emerging. Many candidates have passed by, such as the president’s son-in-law Rakhat Aliyev, but the appointment of Karim Massimov as Prime Minister in April 2014, may signal an ambition of succeeding Nazarbayev. In fact, his nomination could indicate Nazarbayev’s willingness to counterbalance the growing power of Astana mayor, Imangali Tasmagambetov, or an attempt to weaken Timur Kulibayev’s influence, his son-in-law, another likely candidate for succession. After all, Turkmenistan has opted for this pattern of succession, with the former president Niyazov appointing the then little known Prime Minister Berdimukhamedov as his successor. Nevertheless, the president Nazarbayev has consistently avoided indicating any preference and he is still doing so: in a recent piece in the Financial Times, he portrayed Kazakhstan as a country navigating from despotism to democracy and therefore referred to the polls as the appropriate venue to select the national leaders. This entry was posted in Central Asia, Kazakhstan, Presidentialism and tagged authoritarianism, early presidential election, Nazarbayev, presidential election, Succession on April 28, 2015 by Paola Rivetti. Sudan held its latest general election from April 13 to 16 after the voting period was extended by one day due to low voter turnout. With official results due to be released on Monday, April 27, there is little doubt long-time President Omar Al-Bashir and his National Congress Party (NCP) will emerge as the overwhelming victors. This outcome, while entirely predictable, has nevertheless led to renewed speculation about Sudan’s political trajectory, and the prospect of more violence on the road ahead. While these elections do not pose a challenge to Bashir’s hold on power, they do little to reinforce the legitimacy of the NCP regime. In power since 1989, the current leadership has had to contend with unprecedented opposition in recent years, prompted in part by the severe economic repercussions of oil-rich South Sudan’s secession in 2011. Violence perpetrated by rebel groups in Sudan’s embattled periphery further highlighted the prevailing instability in much of the country. Gunmen in North Darfur shot at ballot boxes while in South Kordofan, attacks led by the Sudan People’s Liberation Army-North resulted in the closure of several polling stations. The decision by the main opposition parties to boycott the elections further undermined any added legitimacy the NCP could hope to gain. The decision to stage a boycott came after repeated arrests of opposition party leaders, including in December of last year after an unprecedented coalition of political parties, civil society organizations and rebel groups jointly issued the ‘Sudan call.’ The ‘Call’ expressed a commitment to a non-violent political process aimed at dismantling the one-party state. The NCP government did release two political detainees shortly before the elections, but that did little to alter the sense of opposition persecution. Unsurprisingly given the political environment, the primary opposition parties remain weak. Even the mainstream opposition does not have the nation-wide structures or clear political programme that would enable it to form a government. Given the circumstances, Bashir ended up running against 13 little-known presidential contenders who could hardly dent his share of the vote. In general, Western powers appear to be reconsidering their attitude vis-à-vis Bashir’s government. Long-time a pariah state, not least given the ICC’s arrest warrant for Bashir, Sudan is currently working to reposition itself regionally. It has loosened ties with erstwhile ally Iran while looking to strengthen its links with Egypt and Saudi Arabia. Europe and the US, meanwhile, appear concerned that the removal of Bashir and his NCP could herald a new era of domestic and regional instability. While many western powers continue to issue weak statements condemning the worst of the NCP’s political abuses, these do not seem calculated to have any real effect. This entry was posted in Africa, Sudan and tagged president, presidential election, Sudan on April 24, 2015 by Michaela Collord. In the past couple of years Ukraine struggled with a number of political and economic problems. But a year ago all of them were overshadowed by the military conflict that started unfolding in the East of the country. Since then, at least 6,116 people have been killed, 15,491 wounded and 800, 961 have been displaced. This rapidly escalating crisis in Ukraine put the issue of constitutional reform on the political agenda of the new president, Petro Poroshenko, immediately following his election in May 2014. Every president of Ukraine since the country became independent in 1991 has been faced with the issue of constitutional reform almost immediately after assuming office. The first president, Leonid Kravchuk, had the most difficult task of constitution drafting for the newly sovereign state after assuming office in December 1991. However, it took another 5 years and another president, Leonid Kuchma, for the constitution to be eventually adopted on 28 June 1996. Since then, the constitution was reformed three times (2004, 2010 and 2014). In all three times, the main focus of the reform was on the executive-legislative relations. This time, however, proposed changes go beyond the relationship between the president and the parliament and consider possible decentralization of power. There are always a number of important questions to address when drafting constitutional amendments. First of all, who should be involved in the process? In this respect, Ukraine is not a stranger to controversy. For instance, during the process of deliberation of the constitution of Ukraine in 1992, Leonid Kravchuk chaired the Constitutional Commission while serving his first term as the president of the country. The question of the appropriateness of his position arose in the debates in 1992, when delegates began to insist on more autonomy for what they deemed to be a parliamentary activity. A similar concern regarding who should be involved in the consultation has been raised by the Venice Commission in respect to the recent draft of the constitutional amendments. The President submitted the initial draft of the amendments to both the Parliament and the Venice Commission shortly after his election on 2 July 2014. During the analysis of the draft, the Venice Commission pointed out that no public discussion of the amendments took place and criticized the lack of civil society involvement in the process. To remedy the situation as well as realizing the urgency of the constitutional reform, the president has signed a decree on the establishment of the Constitutional Commission in March 2015. The second question is about the amendments themselves. To comply with the obligations under the Second Minsk Agreement, the new constitution must enter into force by the end of 2015 and provide for decentralization of power as well as adopt legislation on the special status of Donetsk and Luhansk regions. Can Ukraine learn from any other country when it comes to these provisions? If yes, which countries should we be looking at? During the recent discussion of possible reforms, Volodymyr Groysman, the Chairperson of the Ukrainian Parliament, mentioned Poland but unfortunately did not elaborate on what particular issue Ukraine could learn from the Polish experience. We know that constitutions are famously unoriginal documents . But in this context, borrowing from the experience of other countries could be particularly helpful. We will further discuss the question of the constitutional reform in Ukraine next month. Please watch this space. Elkins, Zachary. 2009. “Constitutional Networks,” in Miles Kahler (ed. ), Networked Politics: Agency, Power, and Governance. Ithaca, NY: Cornell University Press. This entry was posted in Europe, Ukraine and tagged Constitutional Reform, president, Ukraine on April 23, 2015 by Svitlana Chernykh. Since President Recep Tayyip Erdoğan became Turkey’s first directly elected president in August 2014 there have been rumours of growing tension between the President and his hand-picked Prime Minister Ahmet Davutoğlu. The first rumoured disagreement occurred right after President Erdoğan’s inauguration and concerned who PM Davutoğlu wished to appointment as his undersecretaries. These are top bureaucratic posts. There were claims that the prime minister could not appoint his chosen candidates due to the objections from the President. Later the issue was resolved when Prime Minister Davutoğlu appointed names approved by the president. Soon there was another rift. This time it became public. One of the closest comrades of President Erdoğan, Binali Yıldırım, announced that Erdoğan was going to chair a cabinet meeting on January 5, 2015 and that such meetings would be repeated every two months. Apparently this was decided without the knowledge of the Prime Minister Davutoğlu as he denied that there was a meeting at the scheduled date. Deputy Prime Minister Arınç criticized Binali Yıldırım by saying that he didn’t possess any official authority to comment on cabinet meetings and that it was a matter for Davutoğlu and Erdoğan. Later President Erdoğan issued a public reminder that under the 1982 Constitution he had a power to preside over cabinet meetings. Subsequently President Erdoğan chaired the cabinet on 19th of January for the first time and then 49 days later for the second time, signalling that he will regularly chair cabinet meetings every one or two months from now on. The next public rift concerned the way the government conducted the peace process talks with the PKK. President Erdoğan publicly condemned the government’s move to create a monitoring committee to oversee the peace process and claimed that he had no knowledge of it. This triggered a public response from the deputy Prime Minister Arınç. He denied Erdoğan’s claim that the President was uninformed about the process, but also stressed that “the government runs the country and the responsibility belongs to the government”. Deputy Prime Minister Arınç’s comments were a direct and open criticism of the President and for many people this was a signal of disagreement between PM Davutoğlu and the President Erdoğan. Another disagreement concerned the chief of the MIT (National Intelligence Agency), Hakan Fidan. The peace process with the PKK was started by Erdoğan when he was the Prime Minister. He controlled the process with the help of Fidan, who was also a subject of disagreement between the President and the PM Davutoğlu. The Prime Minister encouraged Fidan to resign and run for a seat in the parliament. It seemed likely that he would do so until President Erdoğan intervened. There have been other occasions where the president has been critical to the press of the government’s policy choices on the economy. For example, he continuously attacked Erdem Başçı, the head of the Central Bank, while government was defending his policies. Still the question remains: is there really a conflict between the AKP government and its natural leader, the president? Some believe that President Erdoğan’s interventions are moves to affect voters in the upcoming parliamentary elections since “this election is too important for Erdoğan to be left to Davutoğlu”. It also possible to argue that such displays of intra-executive conflict are designed to highlight the perils of semi-presidentialism and gain support for a strong presidential regime. Recently Prime Minister Davutoğlu claimed that “this system causes confusion over power sharing; it should be either clear parliamentary or clear presidential one so that whoever has power is held accountable”. The disagreements may also be the result of the fact that a semi-presidential system has only just started to operate and political actors are getting used to how it operates. Whatever the motives behind it, the Turkish political scene shows signs of intra executive tension between the AKP’ president and the government, even though the level of conflict is not too strong. In any case, the conflicts have not dragged on. They have almost always been resolved in the president’s favour. This entry was posted in Europe, Turkey and tagged President Recep Tayyip Erdoğan, Turkey on April 21, 2015 by Şule Özsoy. On 9 April President João Carlos Fonseca vetoed the Bill for Holders of Political Positions. Clearly, a presidential veto is not a unique event during times of cohabitation. Yet, it was the President’s own party, the MpD (opposition), that together with the ruling PAICV party introduced and approved the Bill in Parliament. What is more, the Bill contained a salary rise for the President of no less than 64 per cent. The Bill for Holders of Political Positions was introduced in Parliament by the parliamentary groups of the MpD and the PAICV in early March. The Bill contains new rules of procedure in parliament so as to improve ‘transparency, ethics and codes of conduct for parliamentarians’. Besides this, the Bill grants a significant salary increase for the President, the Prime Minister, government members, deputies and municipal elected officials. This ‘salary updating’ would cost more than 200 million escudos (approx. 2 million euro), representing 4.1 per cent of all spending included in the 2015 State Budget. After the Bill was passed by Parliament on 25 March, mass demonstrations broke out in Praia, the capital of Cabo Verde. Demonstrators considered the legislation as a legal form of robbery and called on the President to veto it. The Constitution of Cabo Verde endows the president with powers to influence the legislative process. Firstly, the head of state can issue a political veto and return the legislation to the organ which approved it. Secondly, the president can send a diploma to the Supreme Court of Justice in the case (s)he has doubts about the constitutionality of the legislation. Since President Fonseca took office in 2011, he has issued 3 political vetoes. After receiving the Bill for Holders of Political Positions, it took President Fonseca less than 24 hours to use his veto power for the fourth time. In his message to Parliament on 9 April, the President considered the concerns expressed by the citizens ‘legitimate’ and therefore decided to send the legislation back to Parliament. The Constitution defines that the deputies have 120 days to review the law from the date of the reception of the President’s message. If an absolute majority votes in favour of the Bill, the President will be required to promulgate the document within a period of eight days. Yet, the PAICV and the MpD have already indicated that they will not review the Bill. So, most likely, the legislation will expire. By using his veto power, President Fonseca’s thus effectively checked the power of the Parliament. Moreover, the President rejected a law that was made and approved by his own party and which would have increased his own salary. He thus took a non-partisan stance and acted on behalf of the citizens’ interests. His veto was widely applauded in the media of Cabo Verde. Presidential elections will take place in 2016. Since the 2011 presidential and parliamentary elections Cabo Verde finds itself in a situation of cohabitation where the President’s party is not represented in the government and the Prime Minister’s party, the PAICV, controls a parliamentary majority. Ecological tax bill (2012), Bill on amendments to the law of social protection (2013), Bill that grants legislative authorization to the government to review the civil procedure law (2014). This entry was posted in Africa, Cabo Verde and tagged presidential veto, veto power on April 20, 2015 by Lydia Beuman. Robert Elgie, ‘Three Waves of Semi-Presidential Studies’, in Democratization, online first, DOI:10.1080/13510347.2014.960853. Sébastien G. Lazardeux, ‘Cohabitation and Conflicting Politics in French Policymaking, Palgrave, 2015. Shaun Williams-Wyche, ‘Le troisième tour? The effects of the change to concurrent presidential and legislative elections on party campaigning and perception in France’, French Politics (2015) 13: 1, 1–24. Michael S Lewis-Beck and Richard Nadeau, ‘Explaining French elections: The presidential pivot’, French Politics (2015) 13: 1, 25-62. Tyson L. Roberts, ‘The Durability of Presidential and Parliament-Based Dictatorships’, Comparative Political Studies, Online First. Marcelo Camerlo and Aníbal Pérez-Liñán, ‘The Politics of Minister Retention in Presidential Systems: Technocrats, Partisans, and Government Approval’, Comparative Politics, Volume 47, Number 3, April 2015, pp. 315-333(19). Sebastian M. Saiegh, ‘Executive-Legislative Relations’, in Jennifer Gandhi, Rubén Ruiz-Rufino (eds. ), Routledge Handbook of Comparative Political Institutions, Routledge 2015. John P. Willerton, ‘Presidency’, in Graeme Gill and James Young (eds. ), Routledge Handbook of Russian Politics and Society, Routledge, 2015, pp. 81-91. See also the chapters on the Yeltsin era, the Putin era, and the Medvedev era. Craig Allen Smith, Presidential Campaign Communication, 2nd ed., Polity, 2015. This entry was posted in New publications and tagged new publications on April 17, 2015 by Robert Elgie. US – President Obama’s Legacy: Set in Stone or Too Soon to Tell? With just 21 months left in Barack Obama’s term, those who study the American presidency are already making their assessments of his accomplishments and failures, and talk of his legacy has begun in earnest. Having just returned from a political science conference where many presidency scholars were focused on that very topic, the various panels and conversations made me think instead of how far Obama has come from the early expectations of his presidency back in January 2009. Then, the narrative was more about how transformative Obama’s presidency would be and which presidential icon (FDR, Kennedy, or Reagan) he would emulate most. Now, that narrative has shifted to how a second-term, lame-duck president with a Congress controlled by the opposing party can get anything accomplished during his remaining months in office. Looking back, perhaps the bar was set too high for Obama after his successful 2008 campaign, during which he beat the presumptive Democratic nominee (Hillary Clinton) in the primaries and a seasoned Washington politician (John McCain) in the general election. He did so through record-breaking fundraising, the most successful ground game perhaps ever witnessed in American politics, and strong outreach to new, young, and independent voters. Obama’s message of “hope and change,” along with his signature campaign message of “yes we can,” inspired millions. A political star was born during that campaign, but then came the irony of how Americans elect their presidents—once the winning candidate is sworn into office, the excitement of the campaign fades into the day-to-day task of governing. And when that happens, we often witness the disconnect between the skills necessary to win the presidency and the skills necessary to effectively govern, as policymaking is not as exciting or awe-inspiring to watch as the horse race of a presidential campaign. However, in defense of this president, and many others who came before him, perhaps it is the American public, as well as those of us who study the presidency, who need to rethink how we assess job performance in the Oval Office. American voters want transformational leadership in their presidents, yet that style of leadership (defined by James MacGregor Burns more than three decades ago) may not be possible in this political environment. Or, at the very least, it may be much too soon to be thinking of Obama in those terms, despite the early proclamations by some that Obama’s time in office would indeed by transformational (though that was based on his campaign victory and not tangible results from governing). For example, despite one’s views about the merits of the program, passage of the Affordable Care Act in 2010 was a major legislative achievement on a par with FDR’s Social Security program in 1935 and Lyndon Johnson’s passage of Medicare in 1965. But, while media coverage constantly frames “Obamacare” as a win or a loss for the President based on the most recent statistics about those enrolled, costs rising or falling, etc., it will be years, or perhaps even decades, before any real determination can be made about success or failure of the program. Even the case pending before the Supreme Court about technical language in the bill, which could shut down the federal exchange for insurance in states that did not set up their own, only highlights the fact that this type of legislative domestic program is a work in progress subject to alterations (both large and small) for many years to come. And consider current foreign policy issues facing President Obama. While the wars in Iraq and Afghanistan, begun during the George W. Bush administration, may be technically over, the battle against ISIS in the Middle East and other terrorist groups around the globe will continue into the next administration, and probably beyond. Even the tentative agreement recently reached with Iran over their nuclear program, which may be the most significant foreign policy achievement of Obama’s presidency, is too early to call a success or failure as the end result—as in, will this plan truly deter Iran’s development of nuclear weapons and help bring more stability to the region—is years, if not decades, away. The takeaway from these premature discussions about Obama’s legacy seem to only highlight the fact that transformational leadership, or what some scholars refer to as “presidential greatness,” is perhaps impossible in this current political environment so dominated by hyper-partisanship. Most of the modern presidents (an era that begins with FDR) had moments of greatness and historic achievements. However, sustaining that greatness, or being consistently transformational during a two-term presidency spanning eight years is unrealistic. Even having one’s party maintain control of both houses of Congress for one term, let alone two, has become a Herculean task. The last president to accomplish the latter was FDR. Elected to an unprecedented (and now impossible due to constitutional term limits) fourth term in 1944 just months before his death, FDR’s time in office, which saw Democratic control of both the House and Senate throughout his 12+ years in office, is a presidential anomaly. Yet, it has served as an impossible benchmark for each of the twelve presidents who have followed. If beauty is in the eye of the beholder, so too is presidential greatness, transformational leadership, and a presidential legacy. Often, like Supreme Court Justice Potter Stewart’s oft-quoted definition of obscenity, Americans know great leadership when they see it. But, that standard can also be fleeting and may not stand the test of time. Despite the potential long-term success of some of Obama’s programs and policies, the fact that the Democratic Party could not sustain its congressional majority past 2010 perhaps automatically knocks Obama out of the category of transformational presidents. Or maybe it’s just too soon to be having the conversation. Let’s first let the Obama presidency end in January 2017, let ground be broken on his presidential library a few years later, and then we can begin to assess the Obama presidency in its proper historical context. Today’s media-saturated political environment may demand instant gratification, but judging the merits of a president and his time in office can’t, and shouldn’t, be rushed. This entry was posted in United States of America and tagged USA on April 16, 2015 by Lori Cox Han.